"You can bend chains and you can bend bars, but you can't bend people." That's the thesis statement for Strongman, the moving and intimate cinema verité documentary about Stanley "Stanless Steel" Pleskun, the self-proclaimed "Strongest Man in the World at Bending Steel and Metal." Strongman follows Stanless in his struggle to connect to an audience and stay positive, despite the fact that sometimes his feats of strength seem to baffle audiences rather than entertain them. Bending a penny is impressive, but a little hard to grok. When he's not trying to bend steel, Stanless is trying to bend his girlfriend Barbara into the perfect announcer and companion. That means endless rehearsals of the right way to say, "Ladies and gentlemen...Stanless Steel!" and lessons on positive thinking — neither of which are particularly successful, according to Stanless' standards. This is a guy with a vision, however flawed. Can Stanless overcome his limitations — circumstantial and emotional — through sheer force of will? It's a pretty interesting ride, and though my five pound weights are gathering dust in my closet, Strongman really got me thinking: is there a limit to positivity? Let's discuss. 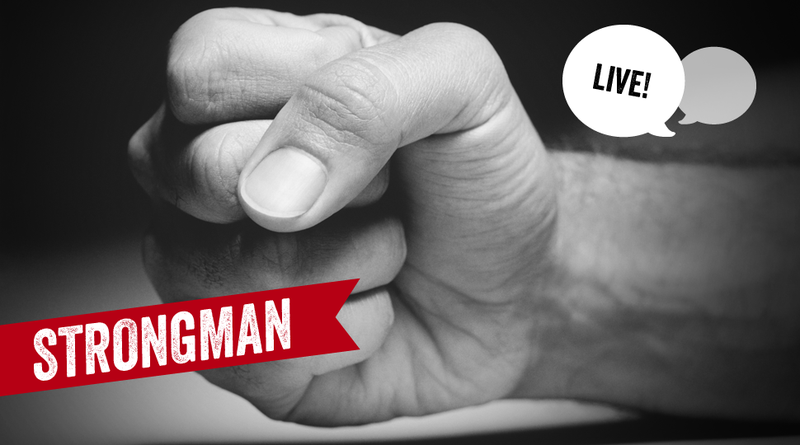 What did you think of Strongman? Is Stanless living in a fantasy world or is he actually bending his circumstances to fit his vision?